Adhesives companies are developing new adhesives to cater to the needs of various industries. The various types of adhesives being developed are pressure-sensitive adhesives, pre-cut layered adhesive films and stick-to-skin adhesives. Pressure-sensitive adhesives are used in HVAC (heating, ventilation and air conditioning) duct work, automotive assembly and sound/vibration damping films. Pre-cut layered adhesive films that address vibration and noise concerns save time in assembly. Stick-to-skin adhesives are used in monitoring and drug delivery devices. ADHESIVES MARKET TO REACH $108 BILLION BY 2020 ACCORDING TO THE BUSINESS RESEARCH COMPANY. 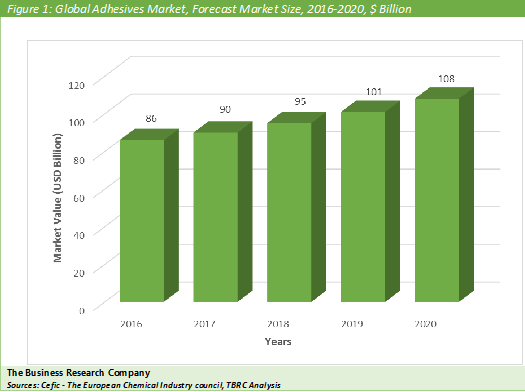 The Business Research Company expects the global adhesives market to grow to $107 billion in 2020. Asia was the largest region in the adhesives market in 2016, accounting for almost two-thirds of the market share. Asia is the largest market because of its large population and economic growth. According to The Business Research Company’s Chemicals Consultant, Yogesh Bathula, global adhesives mergers and acquisitions (M&A) are expected to increase. In 2016 many adhesives companies said they were willing to pursue acquisitions in the next 12 months. In addition, M&A interest is likely to be fueled by stronger corporate balance sheets, liquid debt markets, and continued favourable interest rates. For example, Royal Adhesives & Sealants LLC recently announced it has acquired Adhesive Systems Inc. in 2016. Increases in mergers and acquisitions have led to a stronger market presence in multiple regions for many adhesives companies. 3M Co. is the largest company in the adhesives market with revenues of $10.3 billion from its adhesives division for the financial year 2015. 3M Co.’s growth strategy is to focus on research and development, and increase its presence in emerging markets through acquisitions. For example it acquired Polypore’s separations media business to offer a broader array of products to customers, to help meet customers’ emerging needs for high-value filtration solutions and to accelerate the global growth of 3M’s membrane business. The chart below shows the year-on-year growth of the global adhesives market during 2016 - 2020. Adhesives are substances applied to one surface or both surfaces of two separate items that binds them together and resists their separation. 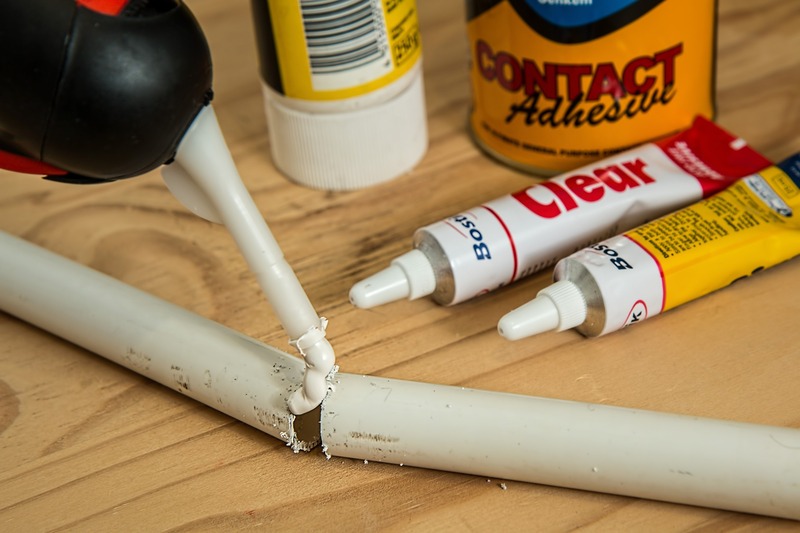 The term ‘adhesives’ is used interchangeably with glue, cement, mucilage, or paste. The adhesives industry comprises establishments primarily engaged in manufacturing adhesives, glues and caulking compounds. General Adhesives - Adhesives are non-metallic materials which are composed by organic polymers in a liquid state when applied, and which become solid after further curing or hardening. These adhesives are of two types on the basis of their origin – namely natural and synthetic adhesives. Natural adhesives are made from organic sources such as vegetable starch (dextrin), natural resins, or animals (e.g. the milk protein casein and hide-based animal glues). These are often referred to as bio adhesives. A simple paste made by cooking flour in water is a natural adhesive. Synthetic adhesives are based on elastomers, thermoplastics, emulsions, and thermosets. Epoxy, polyurethane, cyanoacrylate and acrylic polymers are various thermosetting adhesives. A pressure-sensitive adhesive is used in Post-it notes. Glue is a strong adhesive substance, usually a hard protein gelatinous substance that absorbs water to form a viscous solution with strong adhesive properties and that is obtained by cooking down collagenous materials. Cyanoacrylate, epoxy are glues. Caulking compounds are substances used to seal cracks and holes around windows and other openings. For example in the tunnelling industry, caulking refers to the sealing of joints in segmental precast concrete tunnels, commonly by using concrete. Window and door caulk are examples of caulks available in the market. The adhesives manufacturing industry procures raw materials such as resins, polymers, additives and solvents from suppliers and sends them to formulators to combine, mix, process and produce adhesives. After packaging, the adhesives are supplied to the end-user market for use in a wide range of bonding and sealing purposes. They are used in packaging, construction, automobiles, lamination, footwear and other industries and by retail consumers for basic household activities. Adhesives Global Market Briefing is a detailed report giving a unique insight into this market. The report is priced at $750 for an individual user. To use across your office the price is $1000 and $1350 if you wish to use across a multinational company. About The Business Research Company Visit TheBusinessResearchCompany.com, mail info@tbrc.info or call +447443439350 or +918897263534 or +919160996838 for more information on this and many other titles. The Business Research Company is a market research and intelligence company, which excels in company, market and consumer research. It has research professionals at its offices in the UK, India and the US as well a network of trained researchers globally. It has specialist consultants in a wide range of industries including manufacturing, healthcare, chemicals and technology. The Business Research Company's management has more than 20 years of varied business research experience. They have delivered hundreds of research projects to the senior management of some of the world's largest organizations.